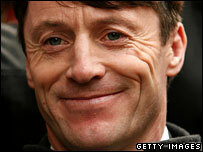 Former champion jockey Kieren Fallon, two other riders and three other people have been cleared of race-fixing. An Old Bailey judge directed the jury to clear them of conspiracy to defraud customers of betting exchange Betfair after a key witness was undermined. The jockeys denied they had tried to make horses lose in 27 races between December 2002 and August 2004. Mr Fallon, 42, whose racing suspension has now been lifted, said: "I am of course relieved... but also outraged." He added: "There was never any evidence against me." Mr Fallon, a six-times British champion jockey, had been suspended from riding for 17 months since his arrest. His legal team claim the trial, which followed a three-and-a-half year investigation, has cost the taxpayer up to £10m. They have called for inquiries into the decision to prosecute the case and police testimony during the trial. The prosecution's main witness was Australian racing steward Ray Murrihy, who found fault with the jockeys in 13 of the 27 races, but also admitted he knew little about the rules and culture of British racing. The judge, Mr Justice Forbes said: "It is abundantly clear that his evidence fell far, far short of establishing a prima facie breach of UK racing rules. "I have reached the conclusion that even if it was appropriate to admit Mr Murrihy's expert opinion... very little value can be attached to it." Mr Fallon, 42, from Tipperary, Irish Republic; fellow jockeys Fergal Lynch, 29, from Boroughbridge, North Yorkshire, and Darren Williams, 29, from Leyburn, North Yorkshire; Mr Lynch's brother Shaun Lynch, 38, of Londonderry, Northern Ireland; and barman Philip Sherkle, 42, of Tamworth, Staffordshire, were all cleared of plotting to throw races. 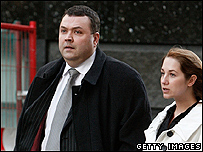 Miles Rodgers, 38, from Silkstone, South Yorkshire, was acquitted of concealing the proceeds of crime. The prosecution claimed Mr Rodgers had laid bets totalling £2.2m on a series of horses in the expectation that the jockeys would connive in losing the races. But the jury heard that Mr Fallon had won in five of the 17 races he was alleged to have been trying to lose. An interview with British racing expert Jim McGrath in March 2006 also presented the prosecution with a problem. Mr McGrath said he had seen very little he found suspicious with the jockeys' performances, but police did not disclose his favourable remarks to the defence until the trial had begun. The detective in charge of the case, Acting Detective Inspector Mark Manning, said that was an "unfortunate" mistake. CPS reviewing lawyer Asker Hussain defended the decision to prosecute the case. "This was a serious allegation of fraud in connection with horse-racing, with the potential to undermine the integrity of a historic sport enjoyed by millions," he said. City of London Police Commander Patrick Rice said the force was disappointed by the judge's decision, but appreciated the reasons for it. "We believe we presented some compelling evidence and it is a pity that the jury did not have the opportunity to consider all the evidence we had gathered." What led to the collapse of the Old Bailey trial?